Juneau County, WI is located between Adams-Friendship and Tomah in central part of the state along the Wisconsin River flowage system which creates both Lake Petenwell and Castle Rock Lake. Juneau is known for farming, hilly terrain, public land, ATV trails, hunting, fishing, rock formations, public land which also has Necedah Wildlife Refuge, Buckhorn State Park, Hardwood Air-to-Ground Gunnery and Bombing Range plus a couple communities including; Necedah, New Miner, New Lisbon, Mauston and Elroy. 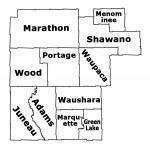 It's surrounded by 7 other Counties; Wood, Adams, Columbia, Sauk, Vernon, Monroe and Jackson. On this page you will find Campable Properties, Camping Property, Campsites for Sale, RV, Recreational Vehicles, Campers on Land for Sale, Popup Campers, Park Models, Campgrounds, Truck Camper, Real Estate for Camping and more located in the county listed by real estate agents. More information on Central Wisconsin. Resorts & Campgrounds for Sale in Juneau Cty, WI.